Who was the most influential literary writer in our Western Culture? The mind springs immediately to Shakespeare. But there was a far more influential writer, who produced only one surviving book. He’s an anonymous writer but he wrote the Gospel of St Mark some fifteen hundred years before Shakespeare wrote Hamlet. We don’t know who he was but we know that he wrote his book in the eastern region of the Roman Empire, probably Antioch, between 70 and 75 CE. Hamlet is performed thousands of times globally throughout the year and although the Passion of Christ wasn’t written for performance on the stage it is also performed globally at Easter, in theatres, village squares and churches, with musical versions, like oratorios, in concert venues. The similarities between the final scenes of the two dramas is striking and although it would be easy to say that the Hamlet scene is influenced by the Christian story it’s probably more true to see them both as having been written by masters of tragic drama, two writers with the same instinct for dramatic and theatrical effects. Shakespeare’s influence is due to his large body of works, all of them profound, moving, memorable and convincing in their portrayal of the human experience. 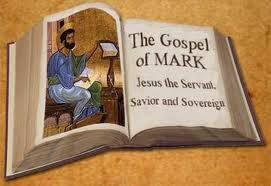 Mark’s influence is based on the fact that his book has come to be regarded as the Word of God. The book was the first written of the gospels and Mark was therefore the creator of the character, Jesus of Nazareth – created in the sense of his being a dramatic character rather than just the vague notion of a resurrected god-man. And the book is also profound and moving and a convincing portrayal of human experience. Throughout Shakespeare’s play Hamlet struggles with the big task he has in front of him – to avenge the murder of his father. He encounters attempts to trap him, to kill him and to neutralise the threat that he poses. He’s surrounded by hypocrisy and corruption. It’s exactly the same with Jesus and in Mark’s Gospel Jesus manoeuvres himself through traps and attempts to kill him. As the final scene of Hamlet approaches the hero realises that he can do nothing – that the evil and corruption will destroy itself around him. All he has to do is face it and maintain his nerve. Various traps are set for him and as the final scene progresses all those who have laid traps for him fall into them themselves. He tells his friend, Horatio, ‘readiness is all.’ He dies in that scene but by being the still point at the centre of the whirling corruption he destroys it and it collapses around him. One could say that it’s a Christian theme and, indeed, Mark’s theme is very similar. After avoiding all the efforts on the part of the priests and Pharisees to trap him into committing blasphemy by referring to himself as the Son of God or the Messiah, which he avoids, once he’s completed his mission and is standing before the Chief Priest he is ready. The witnesses are unreliable and a conviction is doubtful but then the Chief Priest asks him whether he’s the anointed one and he says, ‘I am.’ His enemies are them able to persuade Pontius Pilate to condemn him to crucifixion. Apart from that admission he is silent throughout, even when they scourge him and fix him to a cross. The only other words he utters are a quotation from Psalm 22, the desperate cry ‘My God, My God, why hast though forsaken me?’ He dies and at that moment the veil of the temple is split in two, symbolising the destruction of the wicked establishment. Like Hamlet he has been the silence at the centre of the whirling corruption around him. Like Hamlet he hasn’t had to do anything – his enemies have destroyed themselves. Those scenes, the trial and the crucifixion are probably the most moving and theatrical scenes in all Western drama, rivalled only by scenes that are to be found in the plays of Shakespeare. Both writers were what we might call great writers, with Shakespeare having the edge on him because he repeated that level of success so many times, but because Mark is the most important book of the New Testament we can say that he was the more influential writer.